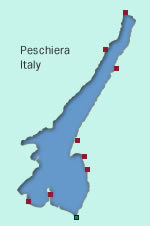 Peschiera covers quite a large area at the southeastern end of Lake Garda. The old town within the fortress walls has a selection of hotels and more are located on the two arms of the lake shore which extend to the west and east of the resort. There is also some hotel accommodation located near the train station and along the main roads leading out towards the junctions with the bypass and the nearby Milan-Verona motorway. The hotels listed on the map below are a selection of three- and four-star hotels in the town. Other types of accommodation, as well as hotels, can be found by using the search box above to our travel fulfilment partner Booking.com. The second map covers some of the popular campsites in the area. Looking for some of the best-rated accommodation in Peschiera? The lakeshore area on both sides of Peschiera is lined with campsites and, of course, these days many of the campsites also offer mobile homes and bungalows for holiday rental. The proximity of the lake beaches and amusement parks such as Gardaland make the option of camping very popular with families.